Warning: Spending time with the Spellman Family is highly addictive and produces uncontrollable bouts of laughter. 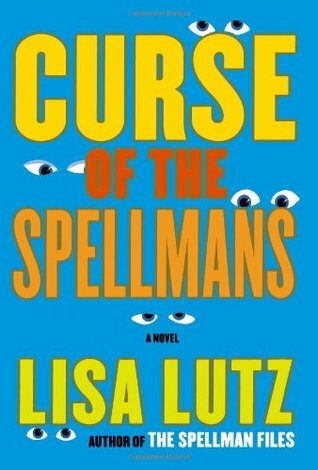 Two years have passed since Lisa Lutz’s debut novel introduced the lovable, dysfunctional Spellman Family and mesmerized readers from coast to coast with the kind of snooping, scheming and blackmailing that could only exist between parties who truly care for one another. We rejoin Isabel Spellman (a.k.a. Izzy), in San Francisco, now thirty years old and once again working for her parents at Spellman Investigations. Enjoying independence living in Bernie’s apartment (an ex-cop and friend) away on vacation. But that was short-lived when he unexpectedly returns nursing a broken-heart, forcing a reluctant Izzy to move back home. Thus beginning the spin of an all new web of action-packed insanity. Izzy becomes fixated on her parent’s new neighbor, John Brown. She’s plagued by unanswered questions…what’s in those bags of shredded paper? If you live alone, why lock doors inside your home? It just didn’t add up and her incessant probing makes Mr. Brown suspicious of her. One thing leads to another as she is convinced his landscaping business is merely a front or cover that’s hiding something much more serious. She investigates Mr. Brown relentlessly, until he finally gets a restraining order against her. Arrested four times in the past three months, Izzy is in jeopardy of losing her PI license and even though her parents disagree strongly about Mr. Brown, she steadfastly refuses to let it go. All the while her father seems to be experiencing a “retirement age freak out” and her mother has taken to vandalizing a motorbike every night. Younger sister Rae has developed an intense friendship with Henry Stone, a police inspector with obsessive-compulsive disorder. The considerable age difference sparks the interest of Social Services, who despite the parents' argument, simply refuse to see things quite so cut and dried. So in order to protect Rae’s newly found “straight-laced way of life,” which everyone agrees should be credited to Mr. Stone’s obvious positive influence, big sister, is recruited and agrees to play along, pretending to be Henry’s fiancee’. It doesn’t take long for Izzy to discover Henry Stone is a really good guy, a little off, but a good guy none-the-less. What follows is a laugh out loud, edge of your seat, knuckle crunching read that’s loaded with that special Spellman sassiness. The smart-mouthed, in your business, the business of private investigating, has been laid bare for all to enjoy in Curse of the Spellmans. This is one of those books you just can’t seem to find a good place to stop - til you get to the last page. And then you can’t help but wish for more. Lisa Lutz has created an original series, that just keeps getting better and better. With a cast of kooky and oh so lovable characters that are both frustratingly nosy and eternally loyal readers are cheering, sneering and giggling their way through these delicious literary treats. Well written, funny and full of heart - Lisa Lutz has developed a signature series that above all else, entertains! favorite mysteries in five categories. widely acknowledged to be the most prestigious awards in the genre.